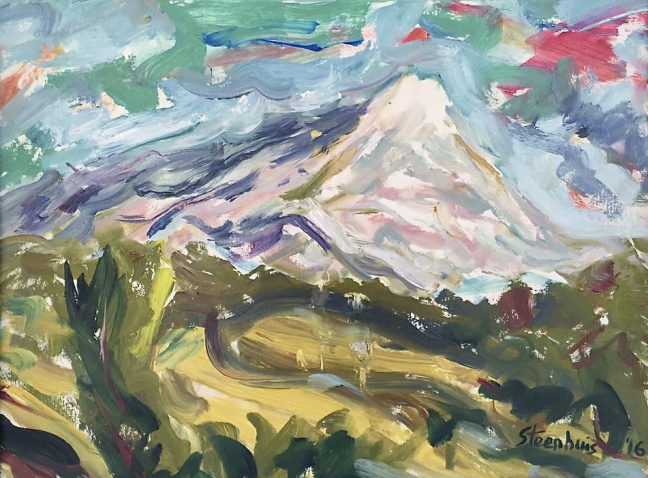 The summer after graduating from Sweet Briar College with a BFA in studio art, I journeyed to the south of France to discover Cézanne’s Mountain. I thought if I could see it for myself and walk in the very places where Cézanne had painted, I might understand his vision and I might be shown the way to my own inner poetry. To see the mountain, to climb, to draw, to paint, to become one with it, was like the Zen master who told his pupils, “Spend 10 years observing bamboos, become a bamboo yourself, then forget everything and–paint.” Mount Sainte Victoire called to my inner voice and made itself heard in my being. Seeking to discover the way to create, what to create and how to create has been my journey. Giving birth to the desire to create happened on Lookout Mountain, Alabama, where my soul was nurtured, and led to my pilgrimage to Mount Sainte Victoire. The door has opened to a life of contemplation, silence, being impregnated with nature to the point that my soul’s fullness is bursting to create, to breathe color, form light and dark onto a canvas, giving meaning to a white surface, however humble it may be. The painting above is a demonstration I did from memory of the Mt. Ste. Victoire during the Cashiers 2016 Plein Air Festival.